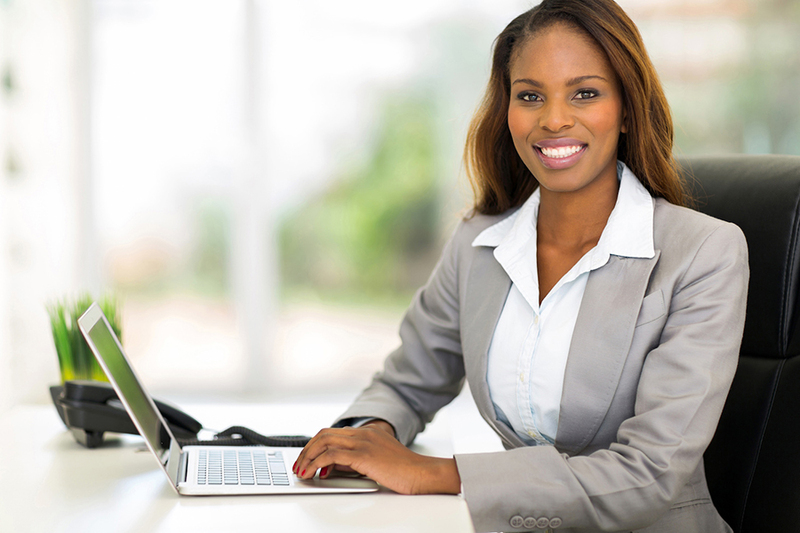 Learn the necessary skills to accelerate your career in 5 months or less. Expert Instructors. High-Performance Tools. End-to-End Projects. Business Science University is different. 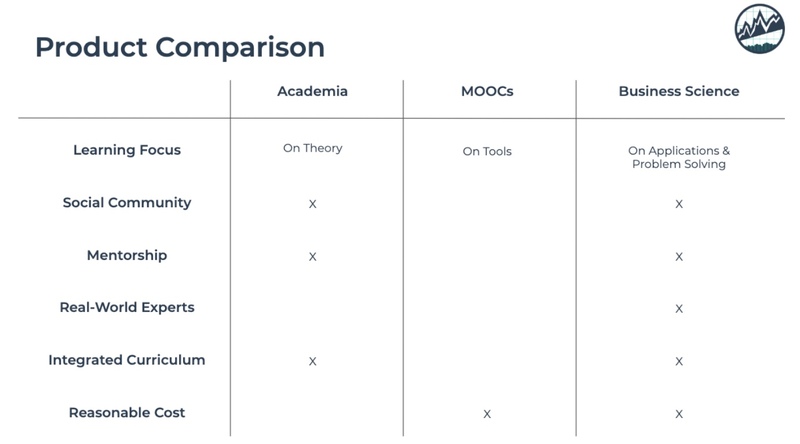 We have re-imagined data science education using our real-world, practical experience and compressed it into an integrated 3-course system that follows the data science workflow and gets results. Data scientists have one goal: to generate business value. They do this by developing products that influence decisions. The data science workflow is how data scientists generate business value. It ends with deploying distributed web applications. The data science toolchain is what a data scientist must learn to be effective in all phases of the data science workflow and ultimately generate value by taking models to production. The goal is simple. You need to implement distributed web applications that solve business problems and generate ROI for your organization. 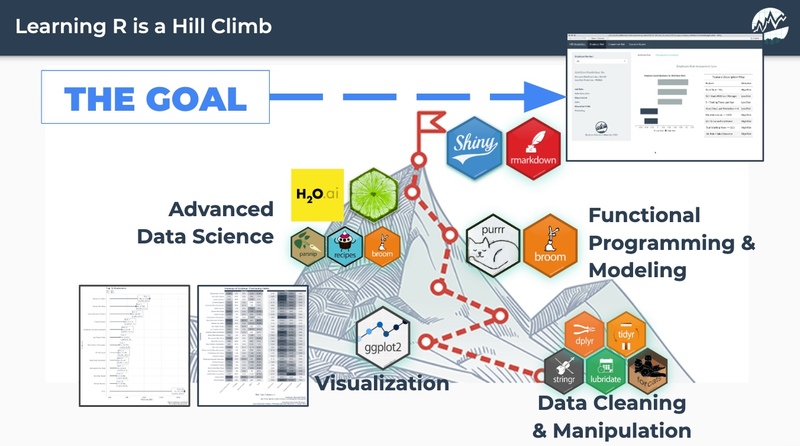 To accomplish this, you need to climb the hill, learning: Data Manipulation, Visualization, Advanced Machine Learning, and Distributed Web Applications. This is going to take years, right? With our integrated 3-course system, you will climb to the top in weeks! In the process, you will learn the most in-demand tools while completing real-world projects. R-Track (shown): tidyverse, H2O, Shiny, and more. Python-Track (not shown): pandas, H2O, Dash, and more. This is how we accelerate your learning. In 23 weeks or less you learn critical foundations tidyverse or pandas, advanced machine learning with H2O, and ML-powered web apps with Shiny or Dash. With a traditional university this would take 4-years. 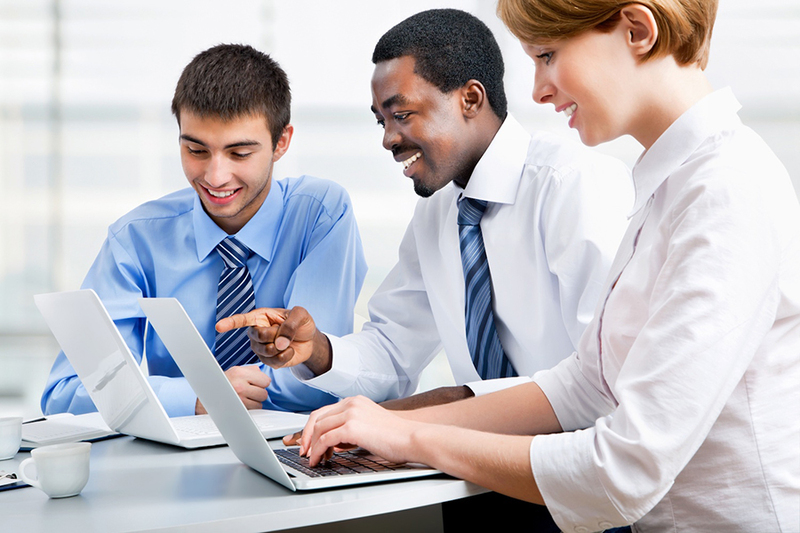 With Business Science University it takes 5-months of about 5-10 hours per week of coursework. 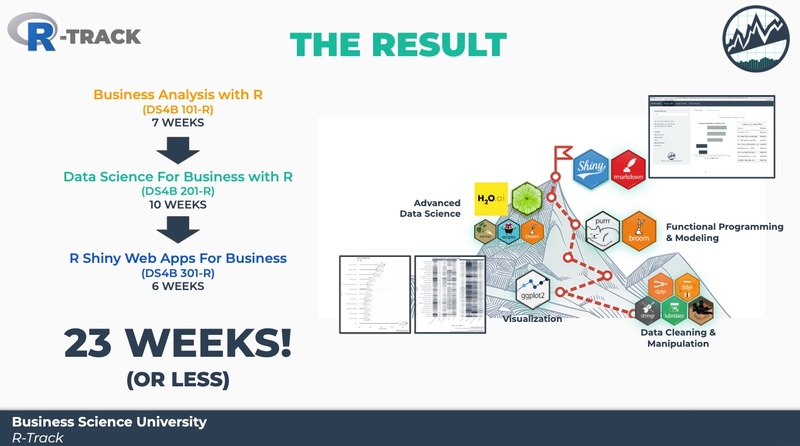 Listen to how one of our students, a high-end data science consultant, reduced his time to deliver data science products by 50% after taking the Business Science University curriculum. Data savvy professionals seeking to make the link between data science and business objectives to increase ROI for their organization. Data scientists working for companies in large consulting firms (e.g. Accenture, Deloitte, etc) and boutique consulting firms that focus on enterprise improvement and ROI. 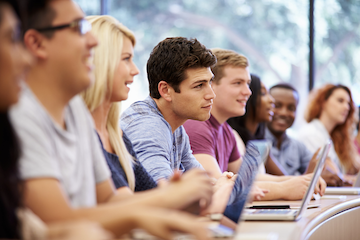 Future data scientists seeking to gain skills in addition to their current program offering. Leveraging Business Science University gets you trained on high-demand skills placing you ahead of your peers in the job market. When you have questions, we are here to help. You have access to our instructors through our private Slack Channel and Forums. Our program checks all of the boxes. Data Science is about learning the right tool for the job. Each have pros and cons, and you should have options. We offer multiple tracks depending on your programming language of choice. ...Or master all of them! 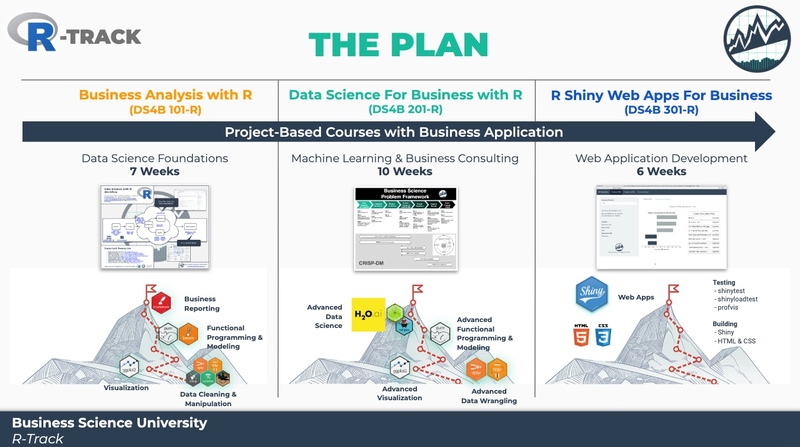 Watch the 2-minute overview of each primary course in the R-Track. Learn data science foundations with 10+ tidyverse packages in one integrated course. 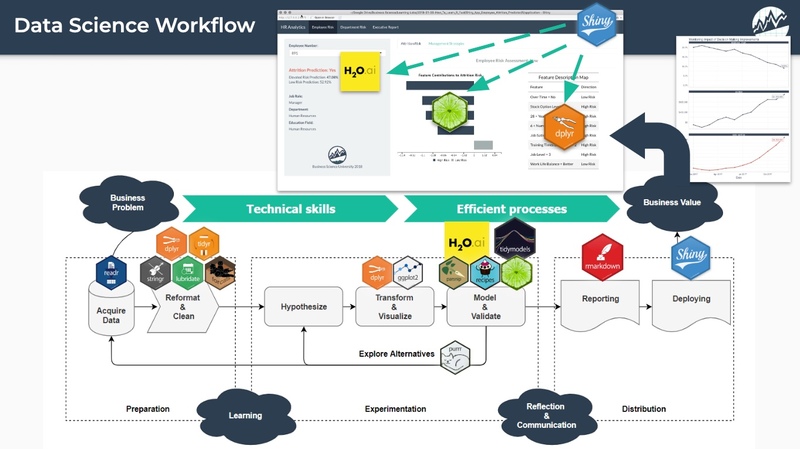 Learn H2O, recipes, lime, while you follow a real-world consulting-style business project. Learn Shiny for building a machine learning-powered web application that is production-ready. DS4B 201-P is the Python equivalent of our ground-breaking DS4B 201-R course. The student learns Python, Apache Spark (great for Big Data), and other tools taking them from beginner to advanced in 10 weeks! The course is under construction but targeted for Q4 2018. "I really recommend this course if you want to know how to do Data Science for business. 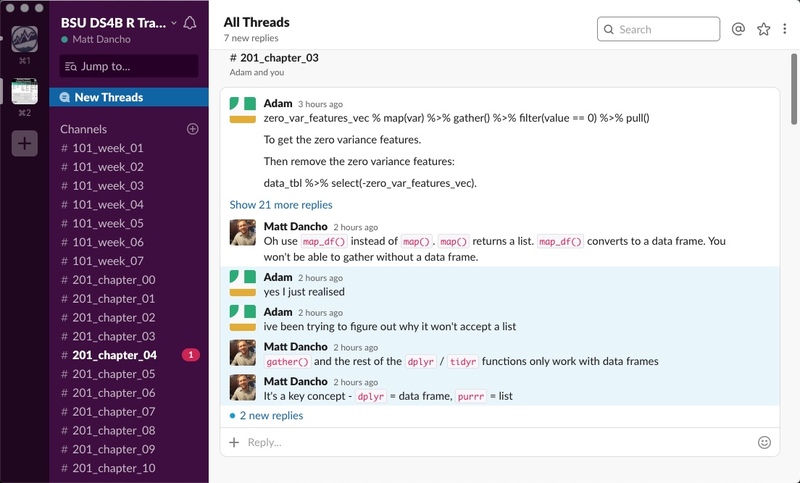 Here Matt will teach you a great path to ROI driven Data Science using R and great tools. The methodology he uses is great if you are involved in any kind of business and want to add value to your company." "Business Science teaches the full data science spectrum from developing advanced models to deploying ML-powered web applications. This is real-world data science!" 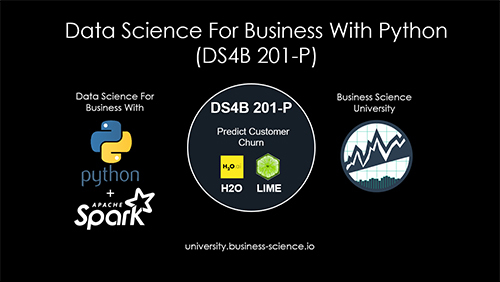 "Business Science University is an excellent resource for learning data science. The HR 201 course does a great job of teaching how to communicate a business problem, how to execute investigative thinking to solve the problem, and properly structuring code for collaboration and reusability. Most importantly, I took away a repeatable methodology and project structure that can be used to solve future business problems using data science. This was well worth the investment." 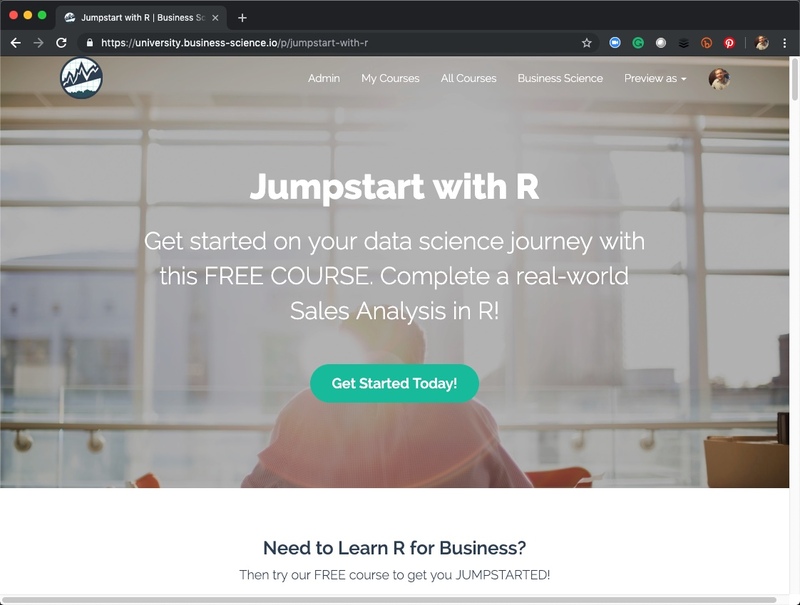 "Business Science created the life-altering packages and tutorials that got me into R"
Matt is giving a workshop on Machine Learning with H2O and a talk on Data Science For Business With Applications In R And H2O. Come see the fun and learn our tools and systems for success! Matt spoke with Kate Strachnyi about the crazy transition of going full time with Business Science. Matt spoke with Kirill Eremenko, Founder of SuperDataScience, on the importance of giving back to the data science community! Listen to Episode 165 with Kirill and Matt! Matt will give a talk on tibbletime and tidyquant including the project roadmap for tidy time series analysis and extendibilty! Davis will be speaking on the future of time series in the tidyverse. See Davis for tidyquant stickers!!! Matt spoke with Kirill Eremenko, founder of SuperDataScience, on how tidyquant came to be, how the Business Science blog is used to help data scientist learn, R vs Python in business, and more! Listen to the episode with Kirill and Matt! Matt gave a talk on how H2O and LIME were used to predict employee turnover, a powerful #PeopleAnalytics solution for organizations! 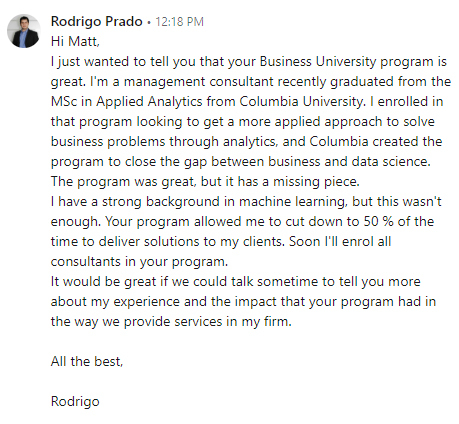 Matt spoke with Mike Delgado about HR Analytics, R and more! Check out the Facebook LIVE video here! Matt presented on time series analysis including R packages tidyquant, timetk, sweep, and tibbletime.